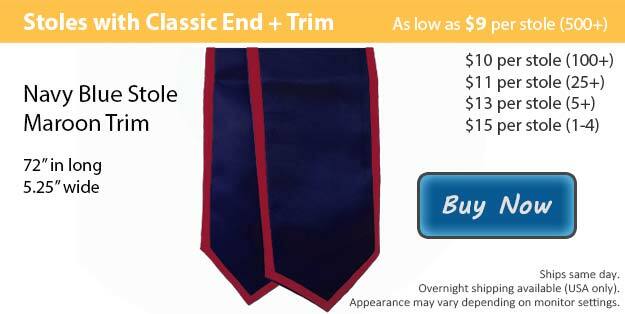 Our navy blue graduation stole with maroon trim might be the stole you need. With each passing day your graduation is getting closer, don't wait until it is too late to get all of your graduation gear together. After working so hard over the past few years and successfully reaching your goals, graduation is the final step in this chapter of your life before you embark on a whole new adventure. As your friends and family join you to help celebrate, you will want to look the best that you know you can. At Honors Graduation we have quite a selection when it comes to graduation attire. We are here to help you achieve the effect that you're aiming for on time for this meaningful day in your life. It is a tradition for graduating students to wear a graduation cap and gown at the time of their ceremony. Students are encouraged to accessorize with various items to signify an achievement or to show their involvement in their group or club. At Honors Graduation we have just the thing to do to pull your graduation wardrobe together perfectly. Here at Honors Graduation we have the exact graduation stole you are looking for. We have over fifteen colors to choose from for your stole and its contrasting trim. Our stoles are also available without the trim if you prefer a solid option. Choose between the classic finish or we have an angled cut as well, both are available in 60 or 72 inches. Our customization team is able to add an image or the wording of your choice to your graduation stole using embroidery. Once your ceremony is over, your graduation stole can be hung on display in your home or office as a reminder of all your hard work paying off.